…according to Chatelaine. You can enjoy them right from the produce section, or you can make some amazing dishes with them. If you lack recipes, here’s Martha with over a dozen great recipes. Enjoy! 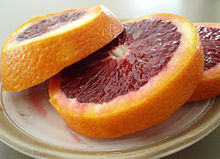 This entry was posted in advice, food and tagged bloodoranges, food, marthast, oranges, recipes. Bookmark the permalink.